Dr. Buckley received her Bachelor’s of Engineering (2001) in Mechanical Engineering from the University of Delaware, and her MS (2004) and PhD (2006) in Mechanical Engineering from the University of California, Berkeley, where she worked on computational and experimental methods in spinal biomechanics. 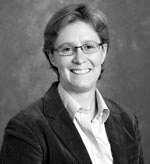 Since 2006, her research efforts have focused on the development and mechanical evaluation of medical devices, particularly orthopaedic, neurosurgical, and pediatric devices. In 2011, Dr. Buckley joined the faculty at the University of Delaware Department of Mechanical Engineering, where she teaches a range of courses as part of the undergraduate curriculum. Dr. Buckley also serves as the Chief Scientific Officer for The Taylor Collaboration, an orthopaedic biomechanical testing laboratory, and also the Executive Director of The Perry Initiative, which sponsors outreach programs to inspire young women to pursue careers in Orthopaedic Surgery and Engineering.